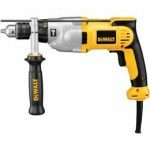 If you want to chisel, drill, and demolish concrete, which tool is best? 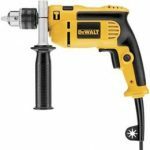 There’s no question that a combination rotary hammer beats a hammer drill any day. But we’ve seen decades of debate over whether Spline is better than SDS-Max. Thankfully, Bosch has settled the question. Let’s review two of their rotary hammers to find out what their answer is. As Bosch explains in their guide to rotary hammers, Spline and SDS-Max bits come in different sizes. For example, SDS-Max bits for the RH540M range from ½ to 1-3/4-inches. Meanwhile, Spline bits are a little smaller. But the SDS-Max system has distinct advantages like one-handed tool-less bit changes and automatic bit locking. As for the RH540M Combination Rotary Hammer, it has 6.1 foot-pounds of impact energy for demolition all day long. And the selector switch makes it easy to choose between functions. There are three options: hammer drilling, chiseling, or Vario-Lock that lets you place the chisel into twelve different angles. Plus, it comes with an auxiliary handle for maximum control and comfort. Near the two-finger trigger, you’ll also find the variable speed dial. The RH540M 12Amp motor has no-load speeds of 170-340rpm and 1500-2900bpm. And although it’s a brushed motor, it’s built for quick maintenance. Finally, while you power away at block or tile, the RH540M protects itself and the user from too much stress. First, it has a soft start plus constant speed under load. And then the clutch disengages the transmission if the bit binds, and that stops the tool from twisting in your hands. The only difference between the RH540M above and the RH540S here is the bit system. 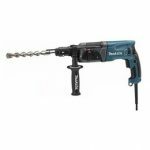 The RH540S uses Spline bits that range from 3/8 to 1-3/8-inches in size. 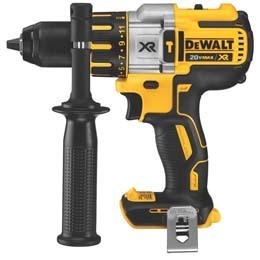 But this rotary hammer also accepts non-Spline bits that have ¾-inch round hex shanks, and the RH540M can’t do that. Just like the other tool above, the RH540S puts out 6.1 foot-pounds of impact energy to punch through rock and tile. 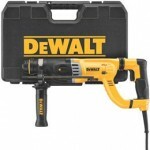 And it has a dual mode selector knob that switches between chiseling or hammer-drilling. Plus, it offers the same Vario-Lock feature that lets you position a chisel at twelve different angles. That’s convenient for demolishing concrete in tight corners. There’s also the option to select one of a variety of speeds from 170-340rpm and 1500 to 2900bpm. This allows you to match the speed to the material you’re working. With its soft startup and protection against bit binding, this generation of rotary hammer is safer and more user-friendly. The brushed motor is built for long life because it has modules for quick maintenance. It’s easy for a technician to replace the brushes and power cord. And the motor and transmission protect against overload, too, with automatic clutch disengagement if the bit binds. 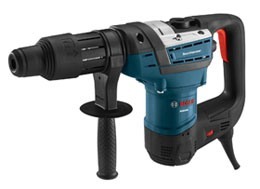 Finally, both of these Bosch rotary hammers let you drill holes up to four inches in diameter with a concrete core bit, or up to 2-1/2-inches with a concrete through-hole bit. And their optimal concrete capacity range is ½ to 1-3/8-inches deep. Since the power and capability of both the Bosch RH540M and RH540S are the same, the deciding factor is the bit system. If you’re already using either Spline or SDS-Max, choose the rotary hammer that matches the bits you already use. On the other hand, if this is your first SDS-Max or Spline tool, it might be worth doing a little research in your area to see what other contractors are using and how difficult it is to obtain one type or the other. 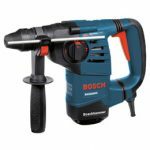 Click here to purchase Bosch RH540M on Amazon.com! 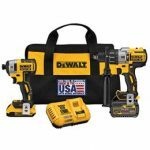 Click here to purchase Bosch RH540S on Amazon.com!